5.8GHz 500mW Amplifier - Discontinued! 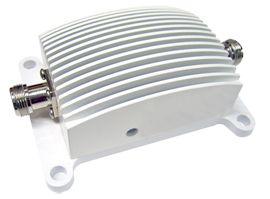 This Bi-Directional amplifier is designed as an outdoor unit with a Low Noise Amplifier(LNA) and gives optimum performance when installed at the antenna. and 2.4 GHz bands in several power options. LAN Cards, low power radio modems.